Get ready to get seriously diverted, friends, because after a brief hiatus, we’re back with your weekly dose of weird. This time, we take a look at a new subculture emerging that could give the Jugaloos a run for their money in the bizarre department. Meet the “Bronies” – a male fandom of the revamped My Little Pony series, My Little Pony: Friendship Is Magic. 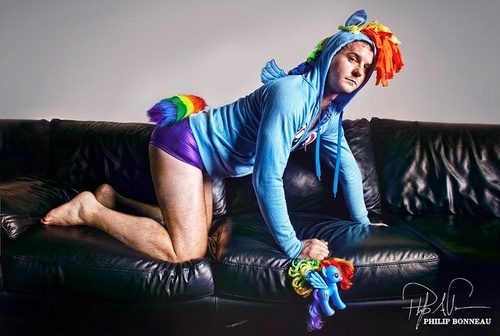 Sure, guys dressing up like rainbow ponies is spectacle enough… but wait for it… do you hear that? Ah yes… they have tribute bands. Saberspark from Brony Breakdown interviews famous My Little Pony enthusiast, Andrew W.K. Now that you’re inspired diverted, be you brony or pegasister, you’re ready to get yourself a pair of ears and prep for next year’s Brony Con!